When I explained where I'd been to my daughter, we opened up a dialogue about plants that eat things. 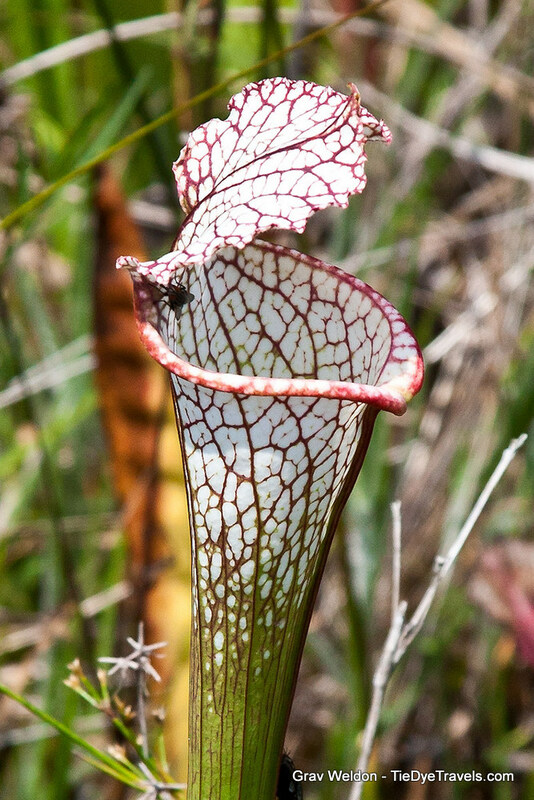 At the age of six, Hunter has never encountered a pitcher plant or a Venus flytrap. Facilities such as the one at Week's Bay are meant to educate people about these sorts of organisms. after the fantastically large breakfast he had served!). pavilion not far from the entrance offers shade and interpretation of the plants at this facility. Carnivorous plants obtain some of their nutrients by capturing and digesting insects and other small creatures. With the pitcher plants, prey are attracted to the sweet smell and fall down into their tubular, modified leaves. The sticky hairs on those leaves trap insects, and they are slowly digested. The raised boardwalk continues on, first encircling a large open area in the center of the compound, then running off for some distance into a lightly wooded wetland. The boardwalk is wheelchair accessible, and pets are allowed, provided that they are on a leash. But due to the nature of the bog, there's very little cover (hence the need for the pavilion). 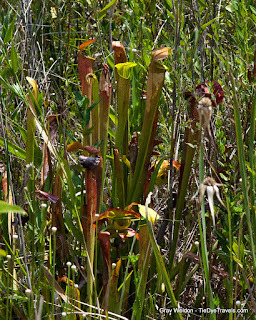 Periodically, the bog must be burned so the plants within it can renews. That's probably pretty alarming, but it's a perfectly normal part of the life cycle here. See what I saw as we walked through the bog. 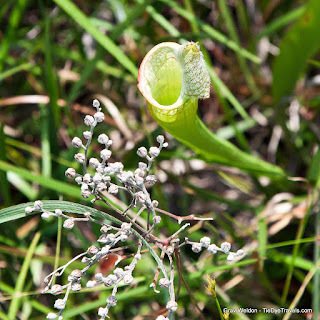 You can learn more about the Weeks Bay Pitcher Plant Bog and the estuary system it's in, by checking in at the Reserve Interpretive Center nearby. There's also information on this website. The Center is open Monday through Saturday, 9 a.m. to 5 p.m. 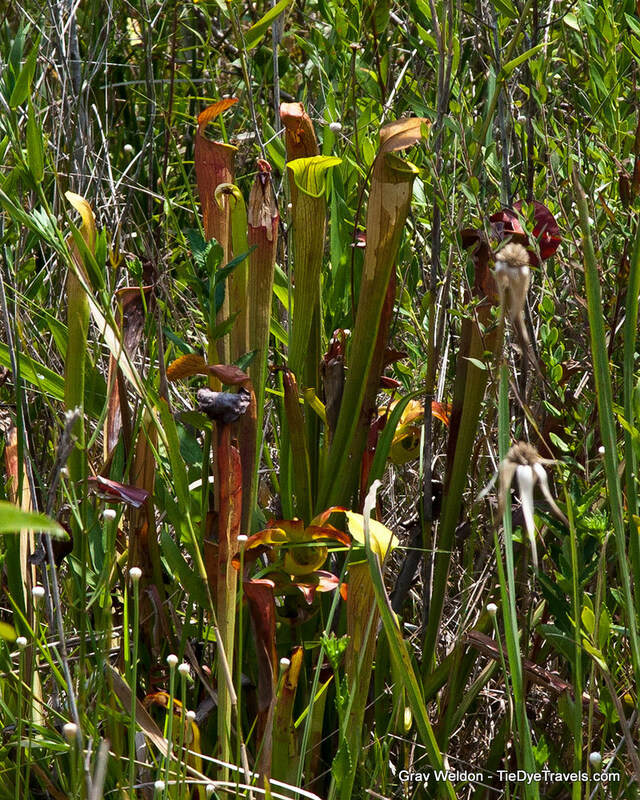 The pitcher plant bog boardwalk, along with another boardwalk in the area, are open daily.